The North Arête offers relatively moderate and adventurous climbing for those who don't mind a massive approach. After a few pitches of loose rock, the climbing is pretty good for four pitches. It's not the best climbing in the High Sierra, but appeals because it is not too difficult and ascends a striking arête on a big and aesthetic peak. It's one of the easier climbs that gives a complete alpine rock experience: a glacier, striking summit, incredible views--all at high elevation. After the first few unpleasant pitches, the routefinding and rock quality gets better and better. 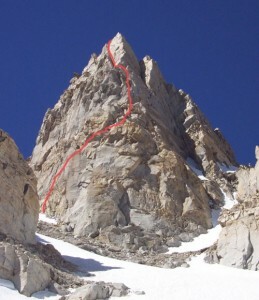 This route is a slight step up in difficulty from the East Face of Mt. Whitney. Which SuperTopo guidebooks include a topo for North Arete?